Cushion cut square diamond owners are fanatic about their choice of diamond shape. 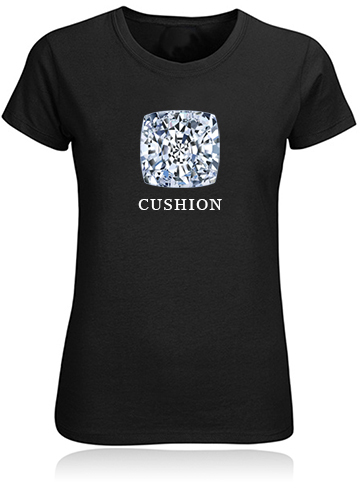 Now you can wear one on your very own Cushion Cut Diamond Shape T-Shirt by Ziamond. The beauty of the cushion cut square diamond is not only its brilliance but the soft curves and intriguing shape. It is a true hybrid of shapes, joining the round and princess cut with a beautiful result. Cushion cut diamond owners and fans are typically contemporary, curious, whimsical, fun and trendy. Each cushion cut diamond image is a high resolution picture printed with the most up to date apparel printing methods on super soft 100% cotton fitted ladies shirts. 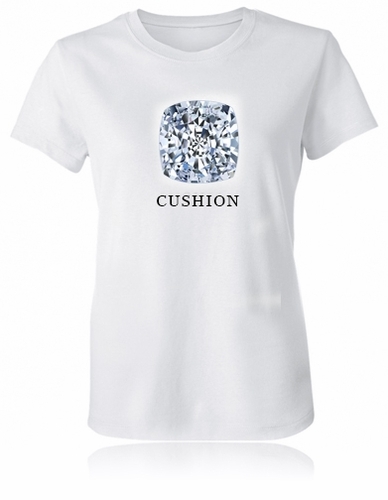 These cushion cut diamond shape t-shirts come in sizes small, medium, large, extra large and extra extra large. Available in white or black color shirts, but if you are looking for a custom color not shown, let us know and we look into it for you.